What did early African people wear ? Africa‘s a big place, so people had very different styles of clothing in different parts of Africa. And this page covers a lot of time, from the Stone Age to the Middle Ages, so there were also a lot of changes in clothing during that time. When did people start to wear clothing? People in Africa seem to have started wearing clothing around 180,000 years ago, soon after homo sapiens evolved – at least, that’s about the time that the first body lice got started, and lice need clothing to live in. African people probably started to wear clothes because of an Ice Age about that time: it got too cold in many parts of Africa to be comfortable naked. 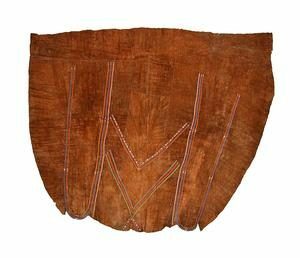 People first made clothing out of animal skins – leather and fur shawls and loincloths. They made the first jewelry out of seashells, ostrich egg shells, and feathers. After many thousands of years, people began to make lighter, less sweaty kinds of clothes. Probably the first kind of cloth made in Africa was pounded bark fibers. You peel the bark off trees and pound it with a rock until the fibers get soft and the hard part breaks off. This makes small pieces of bark cloth which can be pounded or sewn together. In Uganda in Central Africa, for instance, people used the bark of fig trees. This kind of bark fabric may be related to the development of Egyptian papyrus. 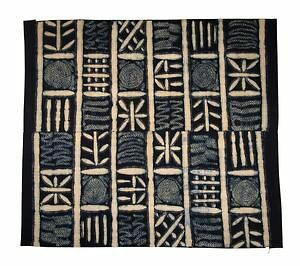 African people also pounded cloth from the raffia palm. The Greek historian Herodotus describes people who wore raffia cloth in the story of the Persian explorer Sataspes. By about 5000 BC – still in the Stone Age – people in Egypt, North Africa, and East Africa were starting to spin and weave their clothing out of a plant called flax. We call that kind of cloth linen. Linen was harder to make, and took longer, but it was more flexible and more beautiful. By 3000 BC, Egyptian workshops made super-fine linen to sell to people in other places. People in Egypt were also producing some cotton cloth by around 2500 BC. But they never grew very much cotton. Egypt really specialized in linen. People dyed this bark cloth to make all kinds of patterns. The most important dye was indigo, which is the dye we use today to make blue jeans blue. There were no indigo plants in Africa. Africans bought indigo dye from Indian traders. Africans used tie-dyeing to make patterns on their cloth. In some parts of Africa, women did most of the fabric work, and in other parts of Africa, men did most of the pounding, spinning, and weaving. But early Africans also kept on wearing fur, and leather, and feather hats and headdresses, and jewelry made of ostrich shells, gold, feathers, and braided grass. Cite this page: Carr, K.E. African Clothing – Early History of Clothing. Quatr.us Study Guides, May 18, 2017. Web. April 24, 2019. Thanks, Hazel! It’s a problem with the coding, not with my typing, but I’ve fixed it now.